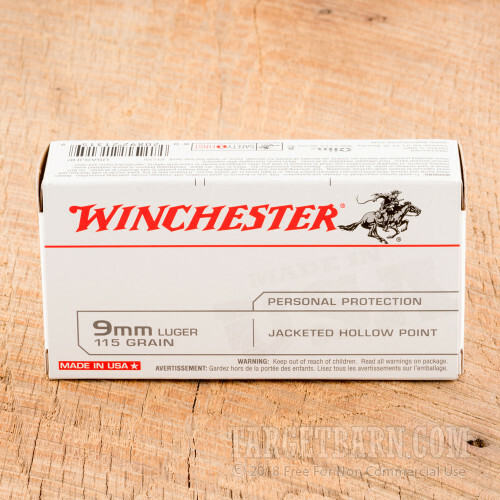 Packaged in boxes of 50, this "white box" ammunition from Winchester is an inexpensive 9mm Luger load suited to defense or training. 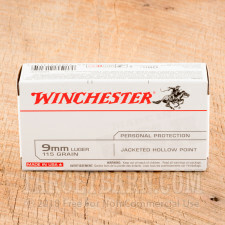 Each cartridge fires a light 115 grain jacketed hollow point bullet at a muzzle velocity of 1,225 feet per second. This relatively high velocity promotes better expansion; however, this is still a standard pressure load that will work well in subcompact concealed carry handguns without producing excessive recoil.